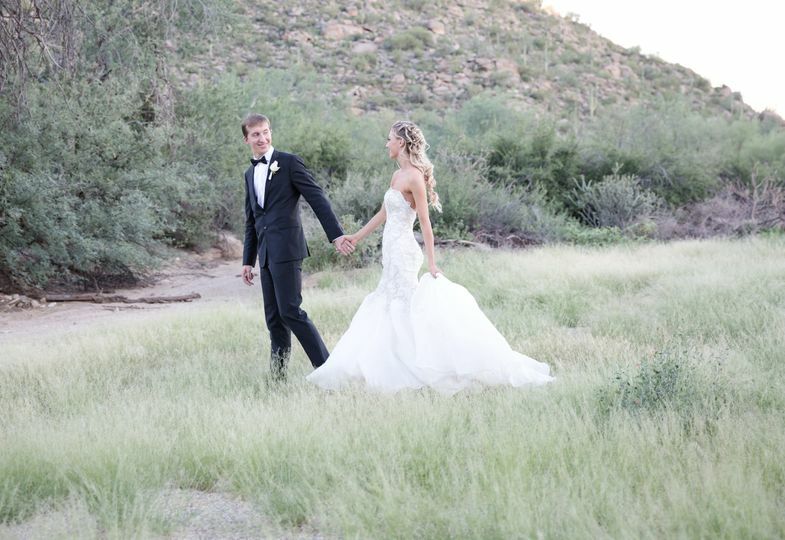 Aldea Weddings at The Landmark is historic wedding venue located in Mesa, Arizona. This family owned and operated wedding venue offers you a historic setting with all the conveniences of modern amenities for your big day. 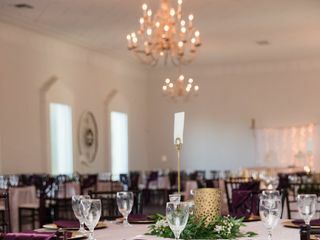 Aldea Weddings at The Landmark has the capabilities to host a wide variety of special events including engagement parties, bridal showers, rehearsal dinners, ceremonies, receptions, and much more. Aldea Weddings at The Landmark has an outdoor setting which offers a picturesque gazebo which is the perfect setting to exchange your vows. 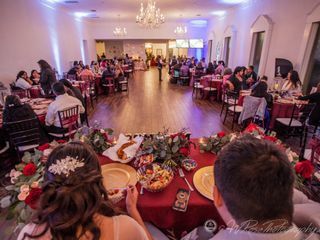 Inside Aldea Weddings at The Landmark you will find the banquet hall which can comfortably accommodate up to 200 guests for a seated meal and dancing. 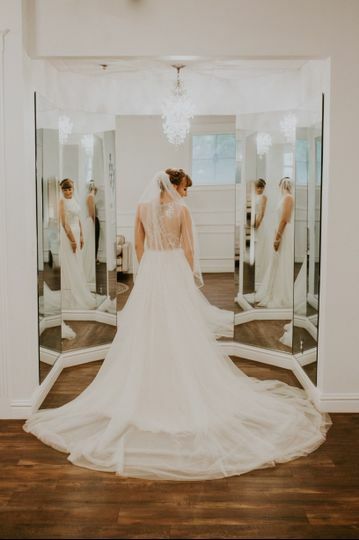 There is also a bridal suite and groom suite that you will have access to on the big day so you can comfortably prepare and refresh for the days events on-site. 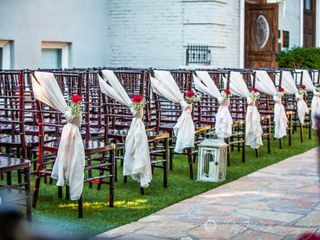 The staff at Aldea Weddings at The Landmark will handle all the set up and clean up of the tables, chairs, and linens on your behalf. Aldea Weddings at The Landmark is a historic wedding venue that was originally constructed in the 1920s. This building has since been renovated to preserve the original architectural details while offering modern amenities. This thoughtful restoration was made to host weddings and other life celebrations. Aldea Weddings at The Landmark offers a variety of services and packages for couples to choose from. This wedding venue is able to offer as little or as much support you need during the planning process and throughout your special day. 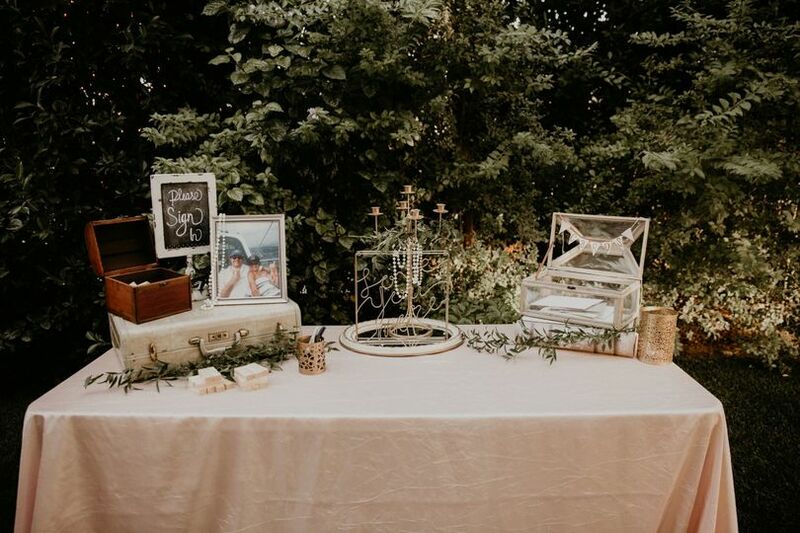 The on-site event coordinator will take care of all the details such as creating timelines, building floor maps, vendor referrals and coordination, and forming a day-of coordination staff. 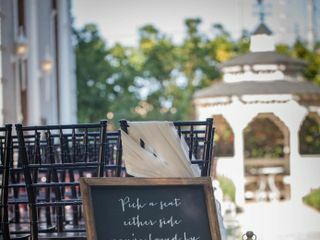 Aldea Weddings at The Landmark will connect you with the best DJ, floral, photography, catering, and bakeries in the area. The larger wedding packages feature photo booth rentals, dessert bar, sparkler grand exit, coffee bar, and many more fun activities. Additionally, all wedding packages with Aldea Weddings at The Landmark are customizable to fit your specific needs. Location: When you step foot inside those iron gates it is like you completely forget where you're at. 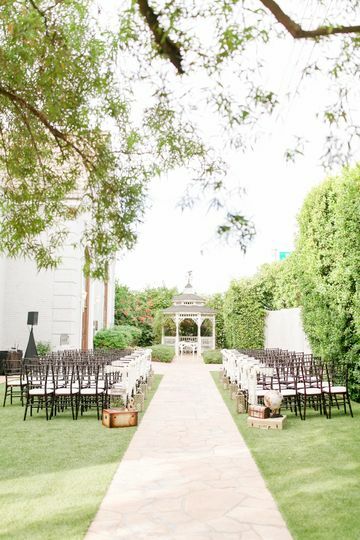 The Landmark transforms into an intimate wedding venue tucked behind tall greenery that makes the location very private. It is conveniently located just 3 miles from Tempe Market Place where our guests stayed at the newly built Hilton. Vendors: The Landmark provides a list of their preferred vendors-- the officiant, DJ, Flowers, Catering, Cake and Photographers. They made it easy to select! All of our vendors were great and took care of us but we highly recommend Wendy Rocket with Infinity Entertainment and Ivonne & Travis Photography. These two were wonderful! Wendy was especially great, she got our guests excited and the energy level was high all night. Our guests keep raving about her! NOTEs: 1.The Landmark will confirm with your vendors and iron out ANY kinks (if there are any issues) but it doesn't hurt to over communicate with your vendors as well. 2. 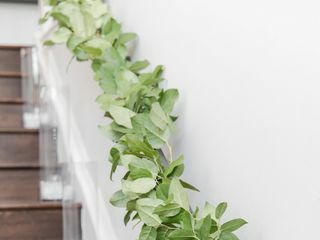 Our florist was not very responsive to emails but Krista and Joseph as well as our photographers assured us that his work is beautiful and that the end product would be perfect--and they were correct. Our flowers were awesome! On site Coordinators: AWESOME! Krista and Joseph were very responsive with all my emails and questions and took great care of us. They did a wonderful job with all of the details. Krista listened to what I envisioned and made it even more beautiful. The day of coordinators were very helpful as well. At the end of the night the car was packed up with everything we brought in and the left over booze--it was so convenient! We had THE BEST DAY. Thanks for everything! When we got engaged back in Aug 2017, the next several months were spent first thing to determine the venue. We wanted a venue that could hold a decent amount of people, a venue that wasn't overly extravagant or exceedingly expensive, and a venue that offered decent services. We visited a total of six or seven venues and Aldea was number 4 on our list to check out. We attended one of the Tuesday night open houses and didn't know what to expect when we walked through the gate. What initially caught our interest (well mine at least!) was there being a little Gazibo and the good reviews already listed. We walked through the gate and we were immediately transfixed with the cute venue! We toured through the property and really liked everything we saw. We still had three other venues to visit but came back for Vendor night January 2018. 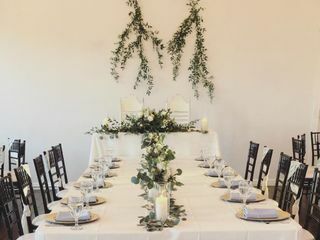 This is when I (well we) fell in love with Aldea - the lights at night are gorgeous, we were in awe of how neat the reception hall looked with tables all set up, and the vendors were great options. 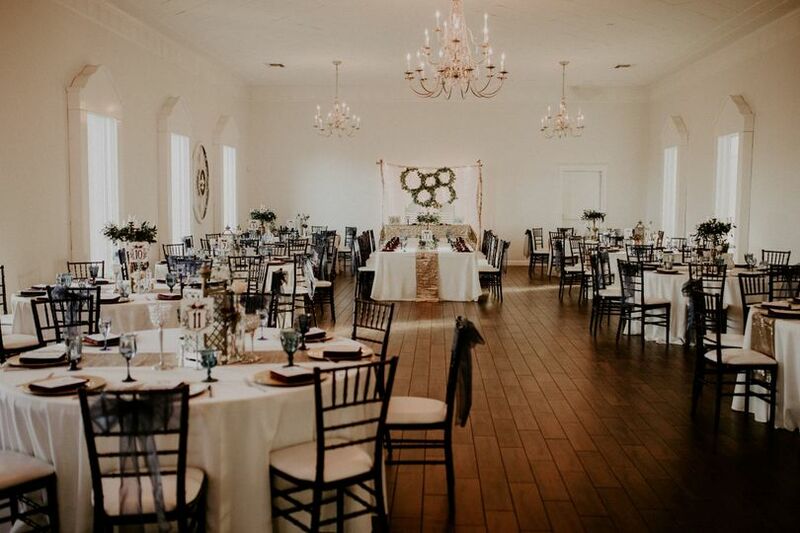 We felt this venue really fit our personality and we let know the wonderful Krista know, whom we'd end up working with through the process, this is most likely the place! Fast forward to May 2018 and our decision was made and we began working with Krista and Joseph in preparation for our wedding in Feb 2019. 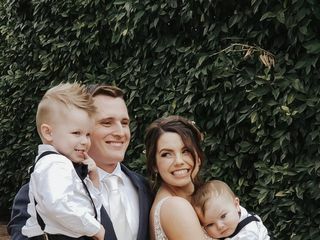 The all-inclusive packages were what we were looking for and the Silver package was perfect for what was offered, which is basically every major category you need for a wedding! Krista and Joseph answered all of our questions and eased our concerns/anxiety about the process! It was well taken care of Over the next 9 months from that point. As we selected our vendors from the provided list, we emailed to Krista and she worked her side to book with the appropriate vendors. The one and only issue we did have with confirmation with a vendor (florist), Krista said she'd get on it and sure enough we received a response in the following day or two. From our design meeting to our final meeting, Joseph and Krista continued to work with us. We communicated through email and they were flexible on days and times to meet with them for discussion. Krista always had detailed notes regarding our choices and we had our own packet they provided us to refer to. They are champs and we appreciate their help and understanding to make this as smooth as possible! The day of, Krista and Joseph did their duty in preparation for the wedding and behind the scenes. Shoutout to Krista because she is MAGIC for the beautiful and awesome way she set up the reception floor and the rest of venue in the hours proceeding the start of everything, through the walkout and later. Shoutout to Joseph for being fantastic running his wonders to make the day as smooth as possible as well. (Also for his amazing cocktail we used for our wedding!) 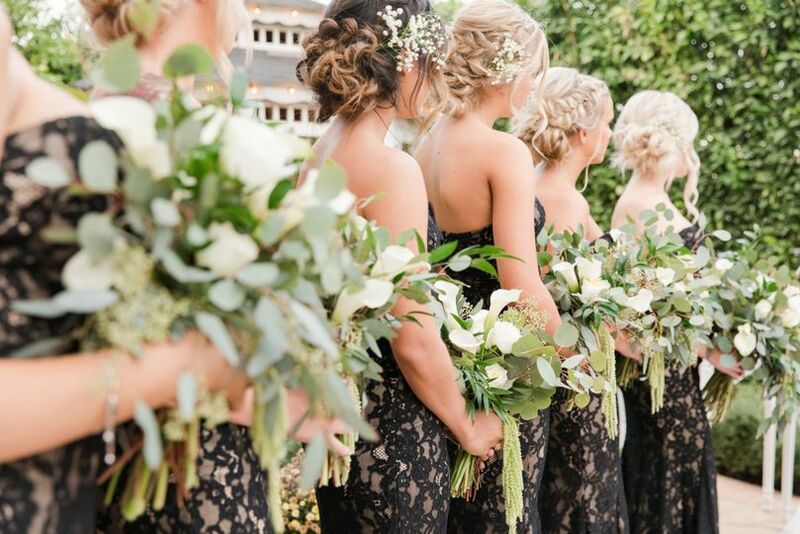 I can't imagine how you must feel every wedding you work, but just know that you are appreciated and couldn't be successful without your coordination and expertise. Although we didn't get the chance to see you through end of that day, we want to thank you and the rest of Aldea team for the assistance bringing our wedding to life! My husband and I went to several venues all over the valley in AZ. We came to the Landmark and instantly knew our search was over. There are two main factors we looked at when selecting a venue: the venue itself, and the people we would be working with. Joseph and Krista have such a welcoming personality that we knew we would work very well with. It is so evident they love what they are doing and they want to provide the most special of special days. The venue itself is gorgeous. I love the options that allow you to choose an indoor or outdoor ceremony where you aren’t locked into that decision when you select a venue. The historic details are to die for and add such a special element. After selecting The Landmark as our venue, we were so excited. The packages they offer are reasonably priced and allow us to add our own customizations. 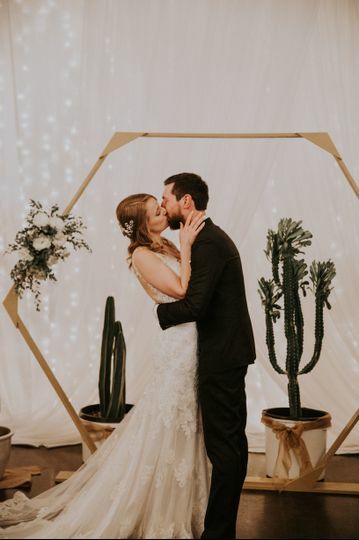 Being an out of town bride, I loved having a preferred list of vendors and people you knew they already trusted and worked with. We were able to contact Krista at every point and if any questions/concerns/issues came up, it was mitigated or resolved that day! You can’t get better customer service than what they offer. The day of, everything went of without a hitch. It rained on our day, but Krista re-arranged and had a back up plan for all the pieces that were supposed to be outside. Even with the rain, everything went smoothly because of her and her team. We honestly could not be happier with all of our selections. 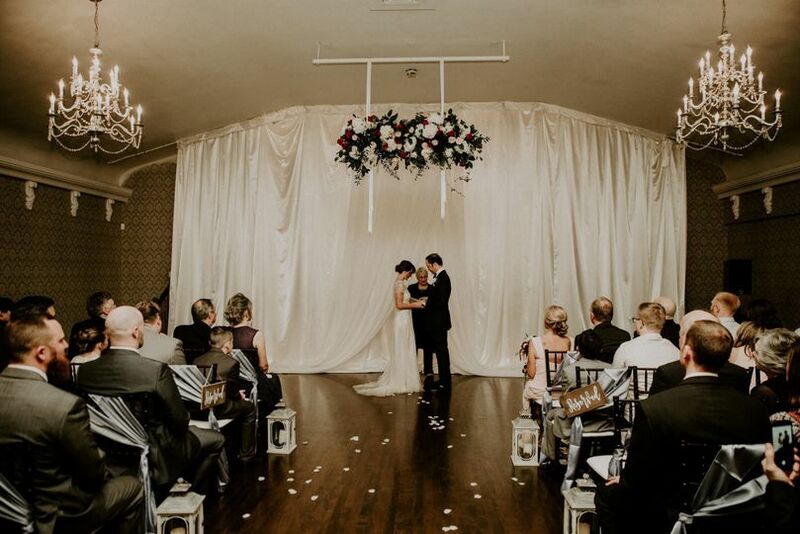 The Landmark has everything you could ever want, and the owners make it a truly exceptional venue. I give the highest recommendation to them. Thank you for everything you guys did for us!! Wonderful venue. The staff was amazing and it&apos;s truly beautiful! What a fabulous team to work with! The staff at The Landmark truly goes above and beyond for every client and it is such a pleasure to work with them. 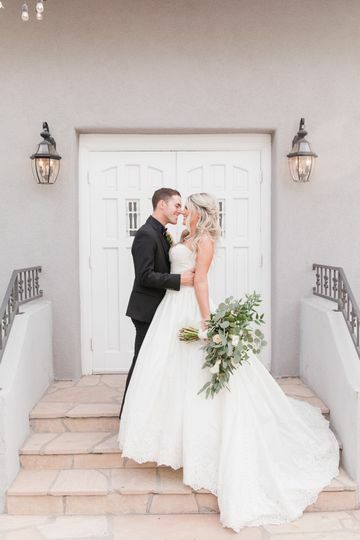 The venue is absolutely beautiful and we love seeing how each couple can put their unique style in it. 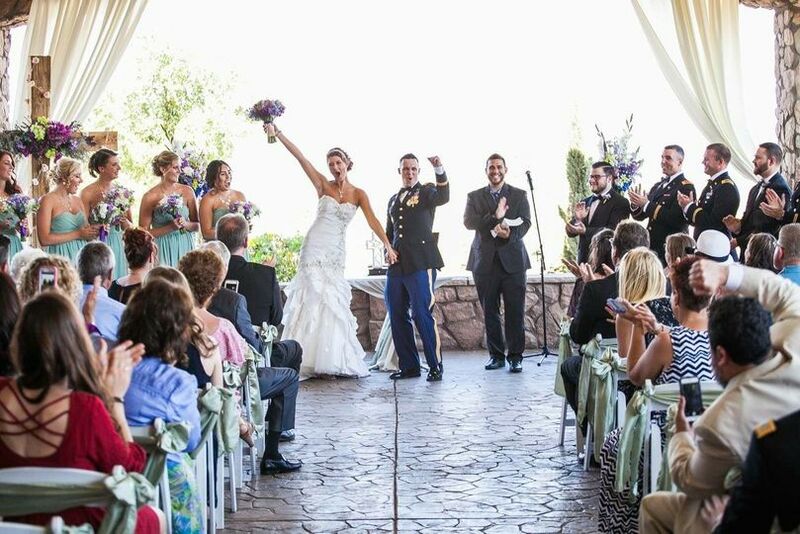 We can’t wait for many more memorable celebrations here!